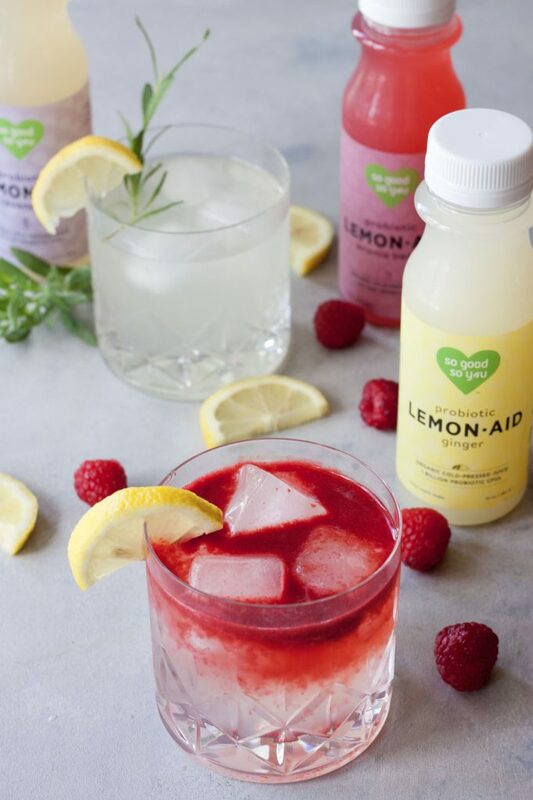 Recipe created to highlight versatility of LemonAids for giveaway (referenced in this post) on Instagram sponsored by Juice So Good. Lemonade is a summer staple. Sipping it on the porch, at picnics, or in a in a cocktail while watching the sunset or sitting by the campfire. The love starts when we’re little for many of us with cute little lemonade stands. One of the neighbor kids had one a few weekends ago and I couldn’t help but smile and we had to go over and get a cup. When I found out one of my favorite local companies came out with superfood probiotic LemonAids I got excited and when I found all 3 flavors in store one day while picking up some juices I had to get all 3 to try. Of course I got home that night and broke open the Lavender one and was happy and upset, happy because it was so good and upset that I didn’t get more. Of course I played more with other flavors including the ginger that I used in this Raspberry Rain LemonAid. Raspberries, ginger, and lemonade in a health mocktail or cocktail, what’s not to love? 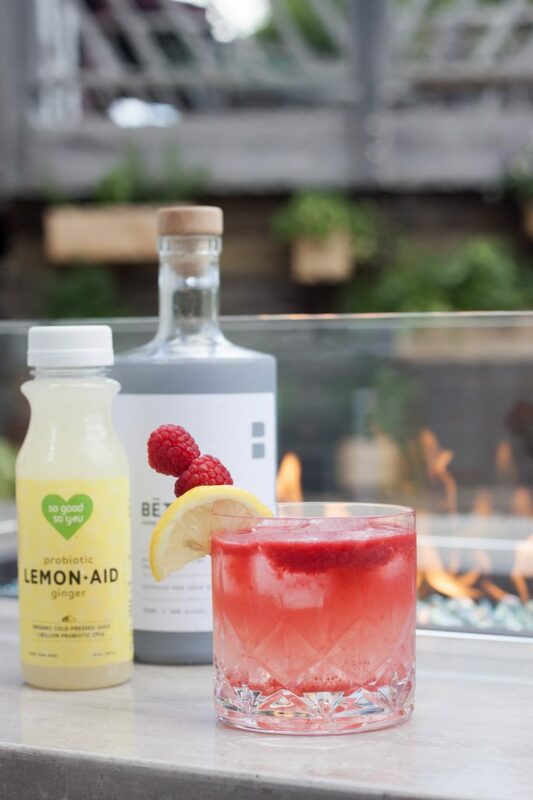 Easy to make, delicious, and fun it’s going to be on repeat for sipping on our patio by our fire table and summer get togethers. Only 2 ingredients, not counting garnishments, for a mocktail or 3 for a cocktail. Loving these LemonAids so much, not surprised since I love pretty much everything Juice So Good, I’m excited to share them with you! 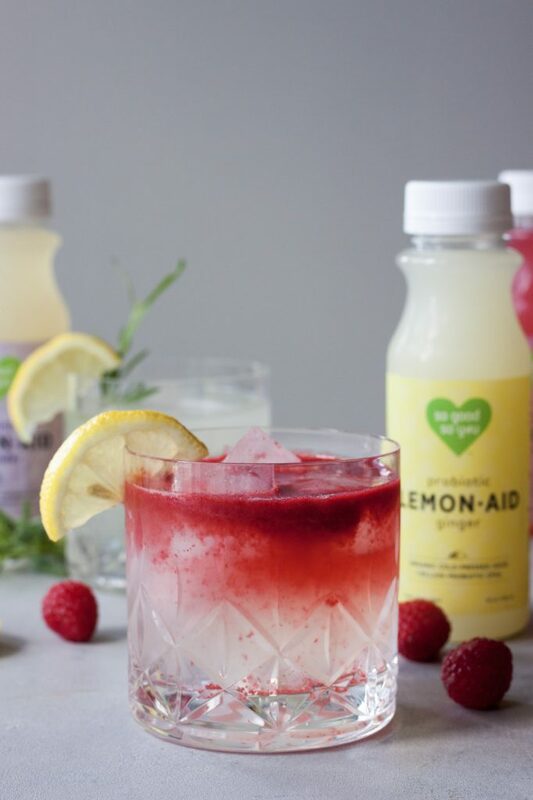 I teamed up with Juice So Good to help share the love for their new LemonAids and celebrate their 3rd birthday with a fun giveaway over on my Instagram. Just in time for the big summer festivities. There are 3 flavors, even more fitting for their 3rd birthday, Ginger, Lavender, and Aronia Berry. They are organic cold-pressed juice with 1 billion probiotic CFUs. No additives, preservatives, artificial flavors, or concentrates. As the bottle says Wellness= Organic + Raw + Love! Fun, fruity, and refreshing LemonAid with probiotics and a cocktail option! Raspberries dance on top of cold pressed probiotic organic Ginger LemonAid. In a Vitamix, blender or even mini food processor, blend raspberries and 2oz of LemonAid until smooth. Fill 2 glasses with ice, optional vodka or rum, and 5 ounces of LemonAid each. Top with a little of the raspberry mixture. Garnish as desired. Enjoy! Raspberries dance on top of cold pressed probiotic organic Ginger LemonAid. A fun and healthy drink with a cocktail option. Fun and refreshing it’s a healthy cocktail that’s delicious! All of these juice flavours sounds AMAZING! Mmmm Lavender! So creative. Thank you, I don’t think you’ll be disappointed! Alisa Fleming recently posted…12 Top Allergen-Free Snacks to Pack for Kids On The Go! Exactly Alisa! I can just sit there, relax, sip, and stare at my herb wall, garden, and the pond and take it all in. A probiotic juice sounds awesome! I love lemon flavored anything, so I think this would be right up my alley! Chrissy @ Snacking in Sneakers recently posted…Lactate Threshold Field Test for Runners! I think you’d love these LemonAids! Ahh, so many great memories of enjoying lemonade as a child! 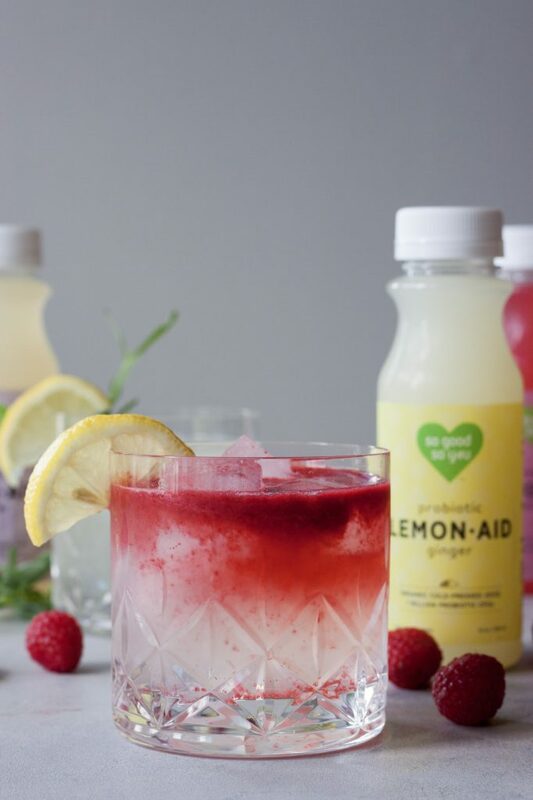 This Raspberry Rain Lemonaid looks so refreshing and gorgeous too! I’m definitely going to get some of the superfood probiotic LemonAids and try this! The cocktail version will be perfect for summer parties with friends! Ohhhhhhhhh I didn’t suspect alcohol would be in this drink 😉 he he he! Just made it that much better – lol! This will be perfect for this weekend!! This is absolutely beautiful, and simple enough for an easy cocktail! Thank you, it’s so easy and simply delicious! Thank you, it is! Simply delicious, wish I could share one with you right now. This looks like the perfect summer refreshment! Love how the colors look in this one too! Vodka and lemonade is my jam, soooooooo totally trying this! I think you’d love this one! Let me know what you think if you try it! Oh my gosh! This looks so good! I hope when I make it I can make it look the same!! It’s a must try, gotta love simple, delicious, and healthy! Yummmy! Nothing better than a refreshing drink in the summer! These are perfect!